YOUNG HARRIS, Ga. - March 8, 2019 - PRLog -- As a first-generation Irish-American girl living in Boston just after the Civil War, Nellie's mother is overprotective, her religion is boring, and she trusts her best friends implicitly… until one lies and bullies her into expulsion from school and the other snatches the love of her life from under her nose. In a time of great gains and upheavals, Nellie faces women's rights, racism — black, white, Irish, Italian — and the struggle of being who she is meant to be regardless of gender, religion, or status. In her world there were three choices: Silk Stocking, the top-o-the-rung, Shanty Irish, the bottom-o-the-barrel, or Lace Curtain, those who refuse to go back and are striving to be the best. 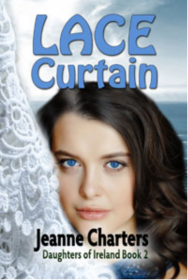 After years of working in radio sales and raising four daughters, Jeanne Charters (https://loiaconoliteraryagency.com/authors/jeanne-charters) became VP of marketing for Viacom TV, then branched-off and opened her own advertising agency, Charters Marketing, with her husband, Matt. "He's the business brain, I'm the creative one." "People sometimes wonder where a character comes from. 'When did you think up Mary Boland anyway?' I don't know about all authors, but for me, Mary Boland was a magical name I heard through my childhood from my mother and aunts. She was my great-great-grandmother. There were no pictures of her and no records of her accomplishments, but she came to me in dreams…a young girl with curly red hair, riding her horse along the Irish seacoast. "Tell my story," she whispered. "In her first iteration, she was the start of a novel called Daughters of Ireland. Mary was the first in three generations of women. Writing class instructors and published authors alike told me, 'Each of these women deserves her own book.' They were right. So, I started over and told Mary's story in Shanty Gold. Next came Nellie Kelly's story, Mary Boland's daughter, in Lace Curtain. Silk Stockings will be the final in the trilogy." Charters is also the author of a humorous memoir, Funny isnt' it? Her novel, Yellow, will be published by Rogue Phoenix Press in August 2019. Local Teacher, RH Lewis, Launches Debut Mystery Novel! Loiacono Literary Agency takes on Chuck Gleason's two romance novels! Black Opal Books takes on Glory Lost by Joyce Shaughnessy! Just released! Hour of the Serpent by Michael Infinito!